* The Daily Show rally backlash has begun in earnest, with worries that the rally will sap GOTV efforts alongside well-founded attacks on its basic premise. Still, I think we’re going, if only as an excuse to see my D.C. friends. * How segregated is your city? Via MeFi. * Being Franklin W. Dixon, author of The Hardy Boys. * Kos, Josh Marshall, and Nate Silver see possible good news in Democratic poll numbers. Still, Democrats will lose big this November. * Mad Men vs. the civil rights movement? * And Amazon is having a huge sale on the entire run of Scott Pilgrim. Enjoy. Some last-minute revisionism on MA-SEN from FiveThirtyEight’s other blogger and (ugh) John Zogby bolsters my increasingly quixotic hopes that party ID and GOTV advantage will pull it out for Coakley, who, at least, is still predicting victory. (She’s also recovering somewhat on InTrade after plummeting there this weekend amidst a sea of pro-Brown media hype.) Anecdotal reports of high turnout are good news for Coakley boosters, as, as Nate puts it, all the scenarios that involve Coakley having a shot of winning involve high turnout; the poll screens that show her losing assume low turnout because this is a special election. (Ben Smith has a more mixed take on turnout and what it means here.) Even the snow could, potentially, flow her way, depending on where it hits the state worst; her GOTV organization should be much larger, with much more experience in getting people to the polls in any sort of weather, while Brown has supposedly hired temps. Here’s Politco’s What to Watch in Massachusetts today. Assuming Coakley doesn’t win, it’ll be time for some pretty furious pro-Dem spinning, on which Ezra Klein is getting started early. Jonathan Chait assists, and assists. Steve Benen looks to the backup plan. Matt Yglesias isn’t even bothering to pretend a Brown victory doesn’t ruin everything. By all accounts Andrew Sullivan has given up. The Nation’s has six scenarios. 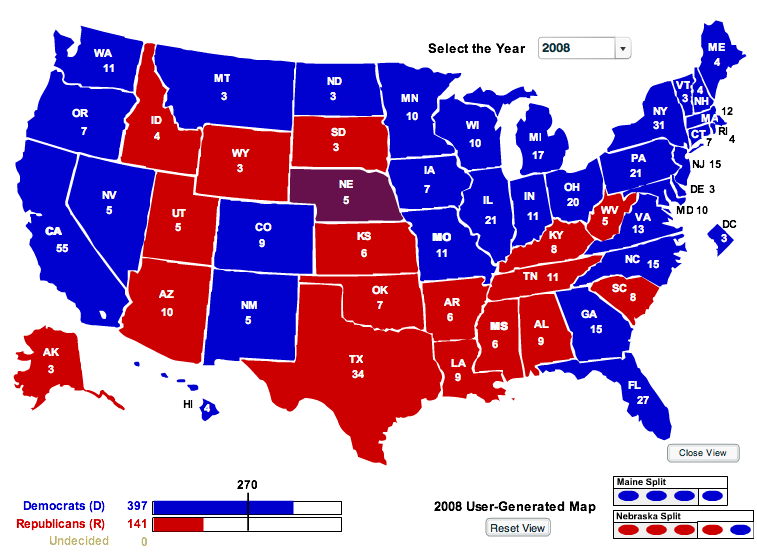 Brown wins and Obama and the Democrats recognize that they misplayed the hand they were dealt by voters in 2008. They do not abandon health-care reform, but they recognize that they must do it better – and they set a rapid but reasonable timeline to accomplish the goal. Regardless of the outcome, Jon Stewart is appropriately apoplectic. Coakley was asked her favorite cream pie. She said banana. Voter turnout is the highest since the enfranchisement of women, with the youth vote at the highest level since 1972. Predictions. Who’s got them? Leave ’em in the comments. I was on Poli-Sci-Fi Radio yesterday (podcast forthcoming) and they cajoled us all into making predictions. Unexpectedly, I was among the most optimistic people on the show, expecting Obama to cross 360 electoral votes and over 50% in the popular vote. I stand by this. To the extent that the polls are wrong, I (honestly) believe they will be wrong in our favor, underreporting Obama’s depth of support and his GOTV operation and underestimating the level of Republican demoralization and widespread discomfort, in different registers, with Bush, Palin, and McCain all. I’ve been predicting / hoping for a Reaganesque landslide since January—it was one of the biggest early factors in my decision to support Obama in the primaries in the first place—and I think that outcome is finally at hand. If things go the way I think / hope they will tomorrow, 2008 will come to be seen as a realignment election along the lines of 1980 or 1932. If I’m wrong, I’m wrong, and I’ve been very wrong before—but that’s my prediction. I’ll go first with what will surely be way-too-high estimates of 397 EVs and eight points in the popular vote, 52%-44%. In my heart of hearts, I think we’ll run the table, including taking Omaha.